Well here we are. The end of the NASCAR season. This is the last weekend we are booked with three races to watch. Thanksgiving and Christmas come next … unless you are already counting the days until the 2011 Daytona 500. We start and end the NASCAR season in Florida. The birthplace of speed. Miami-Homestead is a fairly new addition to our circuit, so shall we take a look at some of the other history of the Sunshine State? If you go to Daytona, do take the time to go to the beach where they used to run. You can see the straightaway and imagine the cars. Ignore the hotels and that the North turn no longer has signs warning folks, “Danger! Rattlesnakes!” There weren’t any, really. It was just Big Bill France trying to keep the race fans from getting too close to the automobiles ripping around the turns. Daytona Beach, Florida is considered the birthplace of speed but not necessarily the birth place of stock car racing. Before the 1930s, the hard packed sand beaches hosted speed trials, land speed records, and early racing competitions. Did you know that there was actually more than one beach course over the years in Daytona Beach, Florida. In 1903, William J. Morgan began promoting automobile races as part of a winter carnival inDaytona Beach. Famous drivers like Barney Oldfield and William K. Vanderbilt raced at the Winter Carnival speed trials. In the meantime, open-wheel cars had been racing at Indianapolis Motor Speedway, changing the dynamics of where and how races were held. Here, automobiles were racing against each other around an oval track rather than in straight single car time trials or races between two cars. However, by 1935, the land speed trials moved from the beaches of Florida to the Bonneville Salt Flats of Utah. It was Sig Haugdahl, who set the land speed record in 1922, who devised a race course which would use the familiar stretch of Daytona Beach sand and the US A1A Highway parallel to it. In the race, the cars used the pavement and the beach, creating a rough oval shape with two different surfaces. The first race held in 1936 and managed by the city was a total failure. 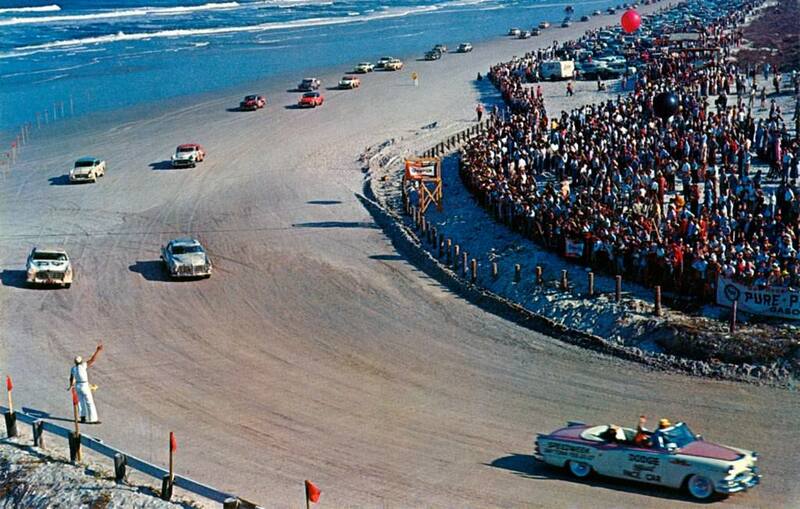 Two years later under Bill France’s direction, the Beach-and-Road Course at Daytona flourished. France invited southern dirt track drivers to come to Florida and test their skills on the sand. HE told them that racing on sand was not that much different than racing on dirt. 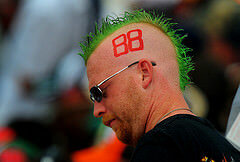 France managed to bring some of the most famous Southern dirt track racers to Florida for his stock car races. With France’s successful integration of the Southern dirt track racers with the beaches of Florida, the beach-and-road-course of Daytona Beach, Florida remained an important part of stock car racing for the next two decades. Facing complaints from the developers who were building hotels along the beach and encouraged by the success of stock car races on paved tracks, France built the Daytona International Speedway and moved racing at Daytona to the paved oval track we know so well.